Open a new window on your PC and turn it into an Apple at heart. You don't have to try to find alternative uses for your laptop to be cool. So you're really a Mac trapped in a PC body. Is sticker shock the only thing keeping you from raising your middle finger at those annoying PC billboards splattered everywhere? Then we have a solution for you. Go take the PC challenge and find your perfect PC laptop, take their cash and run away with the computer. Tuck away the cash and let your inner Mac out. Don't worry, it doesn't really hurt. And all you need is a computer geek to help you out. So roll down to your local Comp USA, oops we mean Circuit City, oops we mean... okay, just go to your local Apple store and drag out the guy with the biggest belly and the nappiest hair. Grab his hand tight and take him to the darkest alleys of your local food court, well out of the view of any mall cops. Look deeply into his crust filled eyes, place one arm on his shoulder and whisper this sweet something into his ear, "What do you know about Hackintosh?" If you're lucky, that pudgy little geek, who idolizes Comic Book Man, will become your best friend in a tie-dyed shirt. The few in the know, okay there are more than a few, have figured out a way to hack those cute little netbooks that everyone seems to be selling these days and install Mac OSX on them. There are even groups to help you find out which PC laptops convert over the best. The process is not too difficult but it is not the easiest thing either and there are several drawbacks as well. For example some of these 9 inch machines can handle OSX, but they cannot handle OSX and sound at the same time. 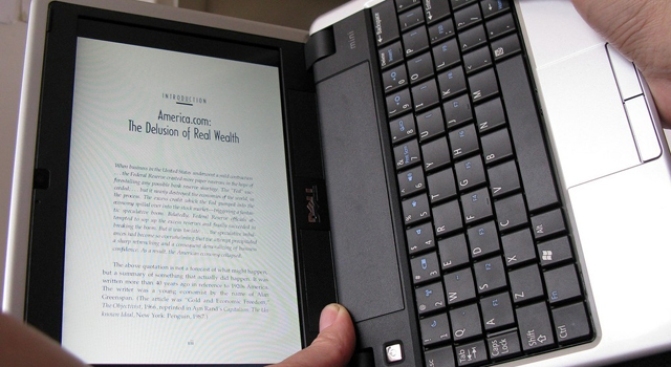 The Dell Mini 9 inch has been proven to be the easiest and most effective when converting, according to various message boards on the net. Follow the steps right and you could have a computer that looks like a PC but feels like a Mac, smells like a Mac (not really), operates like a lovely Mac and by golly is a Mac minus the shell and the fancy price tag. Saving yourself money putting the heart of an Apple in your PC: Worth about $2000. Seeing Bill Gates face when his machines start running OSX before he can copy it: priceless.